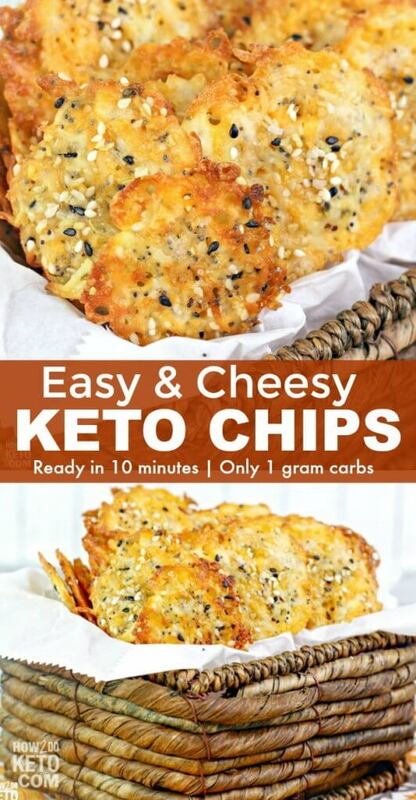 Crispy, cheesy Keto Cheese Chips are a guilt-free snack that’s ready in minutes! They’re so delicious they almost seem too good to be true! When it comes to cravings, there are two camps: people who crave sweets and people who crave salty. I’m usually a sweets person, but my mom is a salty foods lover. Chips are her thing! On a low carb diet, regular chips are a no-no. (Sad face). But these low carb chips are sure to turn that frown upside-down! 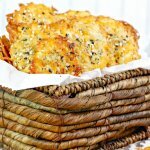 Seriously, if you’re a cheese-lover, then these keto cheese chips are totally going to make your day! Not only are they rich and cheesy, they’re crispy too and totally hold up like a real chip! They’re thicker, like kettle chips, and you can customize them with any seasoning that you like. Only 1 grams of carbs per serving! 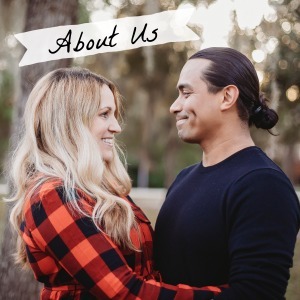 For your convenience in re-creating our keto cheese chips recipe at home, we’ve included shop-able ad links to some of the products and supplies used. Read our disclosure policy here. The above is a quick glance at the ingredients and tools needed to make keto chips. Full ingredient amounts are available in the printable recipe at the bottom of the post. This recipe is incredibly easy, you simply mix the ingredients and bake! 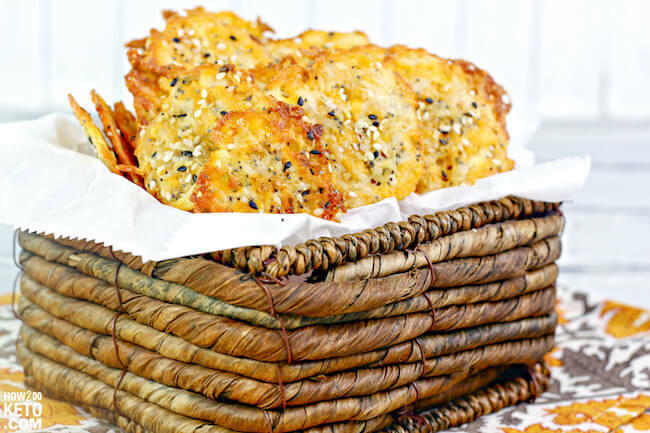 A full printable copy of our keto cheese crisps recipe is available at the bottom of the post. Customize your chips with different seasonings. We used Everything Bagel seasoning here, but you can make them spicy with a touch of chili powder, or any flavoring you like. Add toppings to make nachos! Click here to see our favorite keto nachos recipe. When shopping for cheeses, we recommend buying 100% real cheese blocks and shredding yourself. 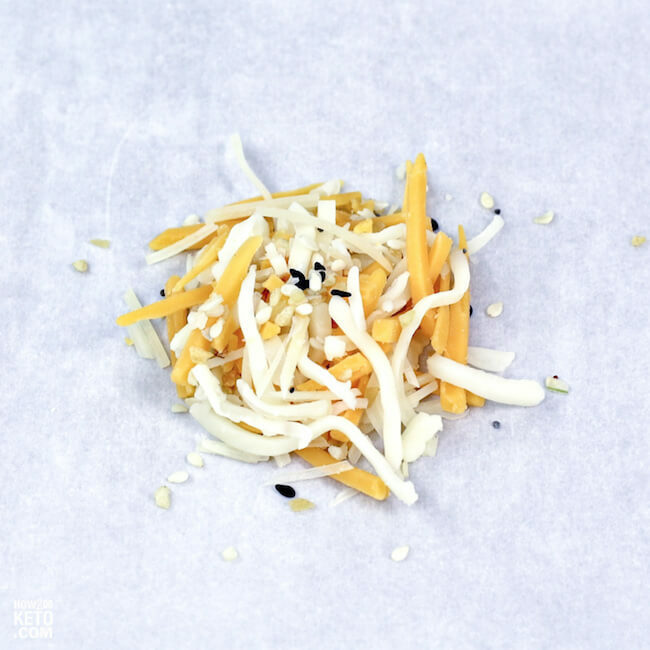 Some pre-packaged shredded cheeses contain fillers and added carbs. Makes about 24 chips, depending on the size of your scoops. 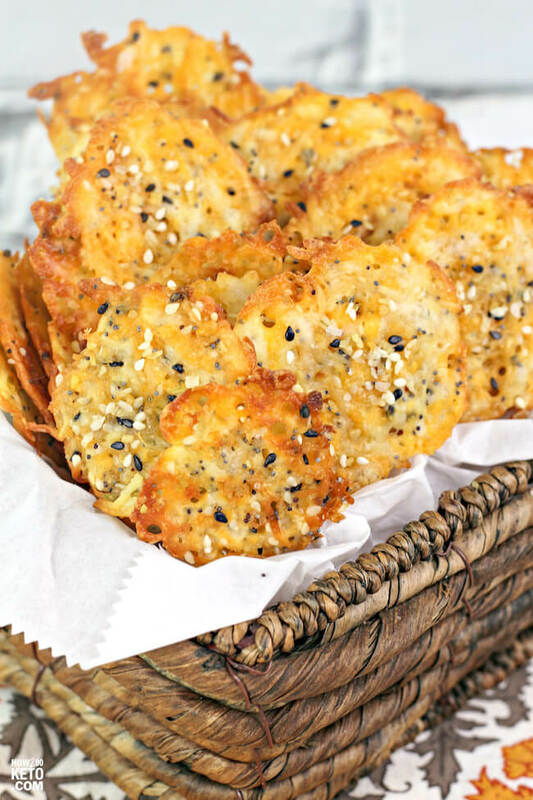 Related: Click here to see all of our favorite keto appetizers and snacks! 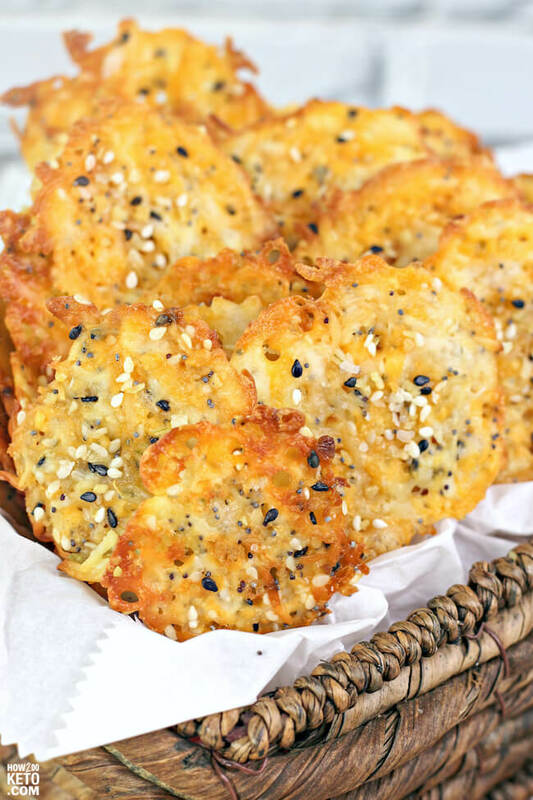 Crispy, cheesy Keto Cheese Chips are a guilt-free snack that's ready in minutes! They're so delicious they almost seem too good to be true! Only 1 gram carbs per serving! Line baking sheet with parchment paper or non-stick silicone baking mat. 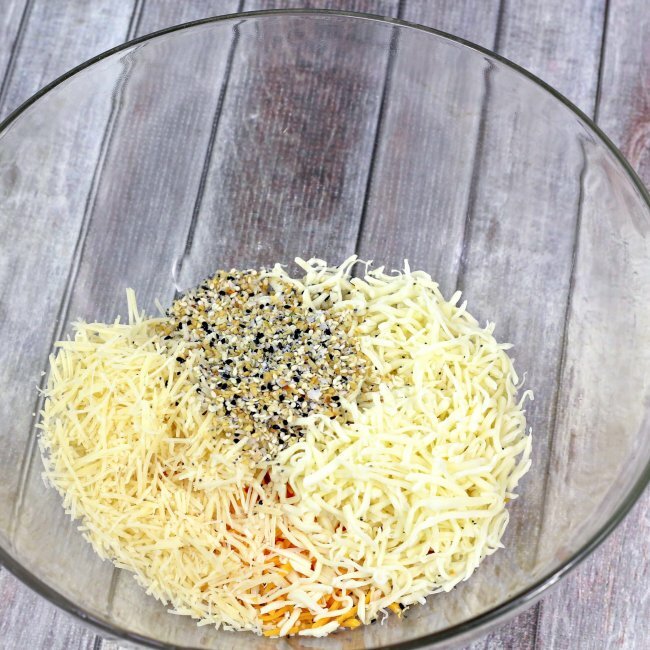 In a large mixing bowl, toss together the three cheeses until well combined. If using seasoning, add half of it at this point. Place a spoonful of the cheese mixture on your baking sheet. Use a teaspoon for smaller, crispier chips or a Tablespoon for larger chips. Leave about 1 1/2" between your scoops. Bake for 6-10 minutes, until you've achieved your desired crispiness. Remove from oven and top with remaining seasoning.